9:15 AM Midrash Teaching - (Teen Ministry available) A light breakfast is available. Shalom! When you come to this House of New Beginnings, Beit Chadash, it is our heart's deepest hope and prayer that you encounter the glorious and life-transforming power of the Spirit of the Living God, and find the freedom and the life - to find the Newness - that He alone can create! When we gather together in His Name, God is in our midst. And He still speaks. He still lovingly and patiently calls us to Himself. In all things, we unapologetically make Yeshua the Messiah central to all we do! 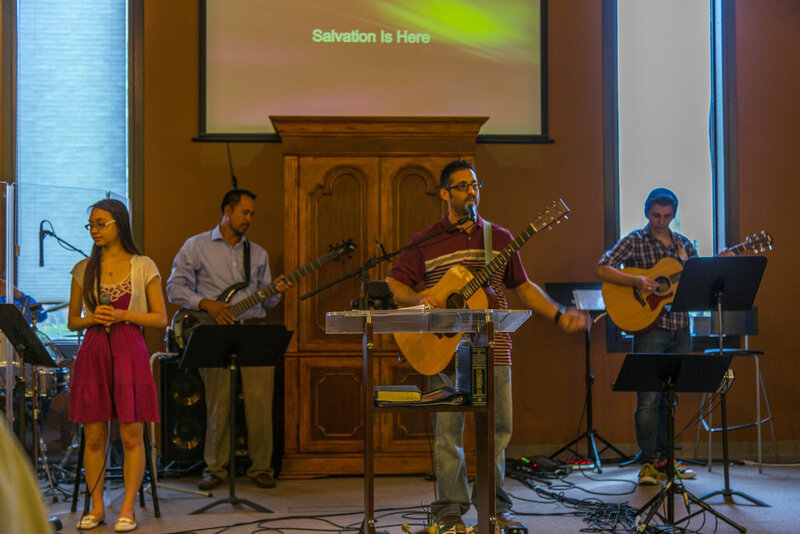 Our time in worship not only includes beautiful and contemporary worship music that exalts the LORD, but also consists of an embrace of the richness of our Jewish liturgical heritage as an important part of our worship experience. Whatever your preferred expression of worship is in our service we want you to worship the Lord in spirit and in truth, whether that be through exuberant verbal expression of your love for Him, quiet and contemplative time in His Presence at your seat or at the altar, or Davidic Dance and the waving of flags and banners in the back of the sanctuary. We serve the Living God of Israel! He has not abandoned us nor left us to fend for ourselves, but He has, in fact, sent us His Ruach (Spirit) (John 14:26; 1 Corinthians 12:1-12), who empowers us and impacts our lives! We believe that the sovereign God is active and working today, and that HE STILL SPEAKS TO HIS PEOPLE! Through the power of His Spirit, He transforms lives, heals broken bodies, restores broken marriages and shattered families, renews wounded souls, and provides for our needs in miraculous ways! At House of New Beginnings, the altars are open during our time in worship and our ministry leaders are ready to pray with you for whatever need you might have! We believe that Nothing is Too Hard for Adonai! Every believing community has a unique cultural expression - even if they do not realize it. While our congregation is wonderfully multi-cultural House of New Beginnings — a Beit Chadash —, with a representation from seemingly every tribe, tongue, and nation, our Shabbat services intentionally and joyfully have a number of beautiful Jewish cultural expressions of worship which help shape the structure of our service. We sing various liturgical pieces which most Jewish seekers would quickly recognize - like Ma Tovu, the Shema, the V’Ahavta, Mi ChaMocha, and the Aaronic Benediction. Each week we also have an abbreviated traditional Torah service in which we march the Torah scroll among the congregation with a parade of children marching behind it, as those in attendance reverently and gratefully express their affection for the Light of God’s Word. The climax of the Torah service is the reading from the weekly Torah, Haftarah and Brit Chadashah (New Covenant) portions. Central to our services is the Ruach-empowered preaching of God’s Word, Genesis to Revelation. Each week, you will be challenged, encouraged, and strengthened in your faith as Rabbi Cosmo passionately teaches and preaches a relevant and Biblically-solid message from the Word of God! In Deuteronomy 6:6-7, we are instructed concerning the centrality of teaching God’s Word to the next generation. Children of all ages will also be blessed by our Jr. Shabbat Service. Each week, they will learn the stories of the Scriptures with relevant life application from a perspective that embraces and encourages their Jewish cultural identity!